The results from the public consultation on water reuse are available through the EU Commission webiste on water reuse. According to the analysis report, 506 participants answered the consultation and the most supported uses appear to be applications not requiring high quality water such as street cleaning, fire-fighting, cooling, etc. and in which reclaimed water is not in direct contact with people (irrigation of non-food crops, irrigation of golf courses, etc.). 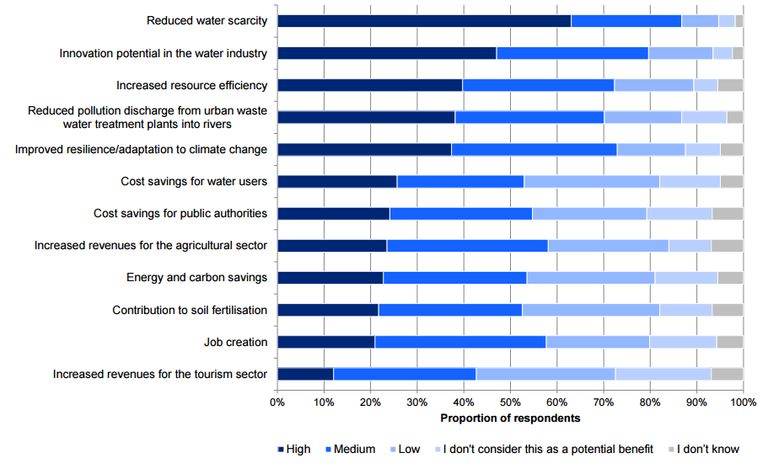 Moderately-supported uses (selected by 40%-50% of respondents) include uses in industry and irrigation in which reclaimed water is not in contact with food, as well as groundwater recharge. The least-supported uses (selected by less than 30% of respondents) include uses in which reclaimed water is directly in contact with food (food industry with food contact, irrigation of fruits and vegetables to be eaten raw) or with people (bathing waters, drinking water). Awareness and perception-related issues emerge as the main barriers that hamper the implementation of water reuse schemes. Negative perception on the quality of reused water, the fact that water reuse is not seen as a component of integrated management, the lack of awareness on the benefits of reusing water and the lack of clarity of regulations are the main issues hampering water reuse at European level. DEMOWARE has participated in the consultation with an integrated response to the questionnaire sent by the EU Commission.